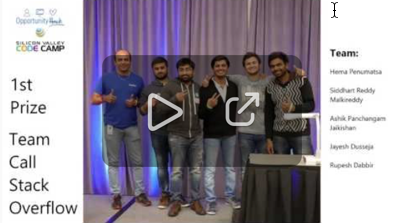 Yesterday concluded our 3-day Hackathon we (SVCC) did in partnership with PayPal. Over 30 hack teams completed 25 projects to benefit NPO’s (non-profits). The hack was widely advertised to not only SVCC past attendees but to college and university students, other past hackathon attendees and many more. I could not be more proud to let you all know that the top two winning teams are from Silicon Valley Code Camp! Not only that, they will be staffing a sponsor table this coming Saturday to show you what they built and let you know how you might become involved next time. Here’s a youtube video of the announcement of the winners! Hopefully, you are registered for SVCC and you are actively picking the sessions you plan on attending. It’s the only way we know how to allocate room sizes so please help us out. It’s best to log in and use either Session Planner A or Session Planner B to pick your sessions. See you in a very short few days!